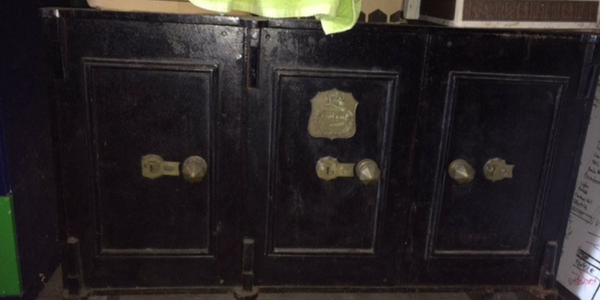 Secondhand Safes - They Don't Make Them Like They Used To! Back when we had our retail shop, we purchased and sold second-hand safes. Recently we shared with you some of the unusual items found inside the safes we opened. Often though, the most valuable item was the safe itself! This safe was a beauty. We don’t have a picture of the actual safe but below is a shot of another crane hinge safe. We kept it in the front window of our shop and were determined never to sell it! Until one day, a client driving a Rolls Royce (who had been in twice previously and we had told him it was not for sale), walked in with an enormous cheque! That day we learned a valuable lesson - everything has a price! It was a bittersweet experience as we really loved the safe but the amount of money was too good to refuse. Many old secondhand safes had handles in the shape of a fist. The workmanship in the old days was amazing. The triple door was the only one of its kind we ever saw, it was very unusual. Needless to say, we have kept this one and one day it will be restored and used as a feature in my house, maybe we will use it as a TV stand!